× 3 = 12 Required Please enter the correct value. What Did the Stock Market Do Today? 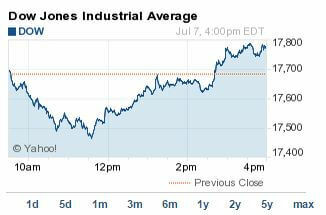 The DJIA today reversed losses from the intraday session and finished up 93 points on the day. Oil prices rebounded slightly on the day after Monday's remarkable downturn. WTI crude futures for August added 0.6% to hit $52.89 per barrel. Brent oil prices added 1.4% to hit $57.32 per barrel. Greece's prime minister is poised to offer a new set of proposals that could keep the nation in the Eurozone. However, German media have tempered expectations by reporting that the "new plans" are the same as the "old plans" and that Greek leaders seem very unwilling to accept austerity conditions for emergency cash. Concerns remain about what happens if Greece exits the euro, but the markets seem to view China's market woes as a long-term challenge that many investors can address later. Stock Market News: The Dow gained today despite concerns about Greece's economy, China's faltering stock markets, and news that the U.S. trade deficit in May hit $41.9 billion. The utilities sector added 1.7% on the day. Shares of Duke Energy Corp. (NYSE: DUK) added 3.3%, Southern Co. (NYSE: SO) added 2.6%, and NextEra Energy Inc. (NYSE: NEE) added 2.5%. Duke Energy was particularly strong today after it announced plans to hike its quarterly dividend. International Insight: As the Australian dollar cratered below $0.74 in exchange value, the International Monetary Fund suggested that the U.S. Federal Reserve should not raise interest rates until 2016. The global financial agency said that domestic growth could be "decimated" by a surging dollar. On Tap Tomorrow: On Wednesday, the June-ending earnings season officially kicks off. Companies reporting earnings this morning include Alcoa Inc. (NYSE: AA), Bank of South Carolina Corp. (Nasdaq: BKSC), Ceres Inc. (Nasdaq: CERE), Chase Corp. (NYSEMKT: CCF), and WD-40 Co. (Nasdaq: WDFC). Investors will also be paying close attention to the release of minutes from the Federal Open Market Committee's June meeting and the weekly crude inventory update. Stocks to Watch No. 1, SHAK: Former IPO darling Shake Shack Inc. (NYSE: SHAK) slumped more than 10% intraday on news that investment firm Morgan Stanley (NYSE: MS) slashed its rating. Morgan Stanley said in a very blunt research note that market fundamentals do not support the company's overpriced stock. Analyst Michael Glass explained that on 2017 estimates, the burger chain's stock traded at 80 times EBITDA and nearly 325 times its price-to-earnings ratio. Stocks to Watch No. 2, AMD: The broader semiconductor index SOX fell to its worst level since February, dipping more than 2% on the day. The sector's biggest loser was Advanced Micro Devices Inc. (Nasdaq: AMD), which saw shares crater more than 15% after the semiconductor firm slashed its quarterly outlook and warned of weaker than expected PC demand. Stocks to Watch No. 3, TSLA: Shares of Tesla Motors Inc. (Nasdaq: TSLA) slipped more than 4.4% on news that Deutsche Bank AG (USA) (NYSE: DB) has downgraded the auto giant from a "Buy" to a "Hold." The investment firm said it was bullish on the company's long-term plans, but raised valuation concerns as the firm leverages its business to expand its scale. Stocks to Watch No. 4, DEPO: Shares of Depomed Inc. (Nasdaq: DEPO) surged nearly 40% today on news that the drug maker is a hostile takeover target of Horizon Pharma Plc. (Nasdaq: HZNP). Shares of Horizon slipped 1.8% on the day. According to reports, Horizon had been working on a closed-door deal to purchase the firm, but Depomed's board of directors has resisted multiple offers. Instead, Horizon is taking the pitch directly to investors in a hostile deal worth up to $3 billion. Does Twitter's New Shopping Feature Make TWTR Stock a Buy?